Part 2 in the study of reflections in water. 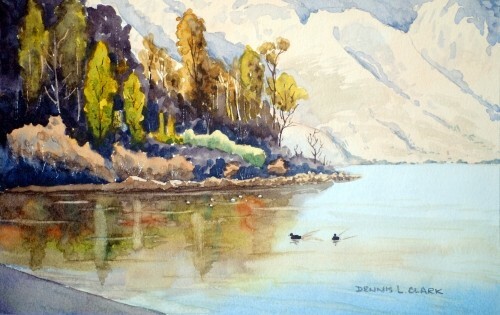 This is a nice challenge in painting reflections, in watercolour, of trees and shrubs in the calm water of this cove on Lake Wakatipu. The challenge is also to show it as early in the morning. Mask the larger areas with a d brush and mask the smaller areas with the tip of a ruling pen or a rigger brush. 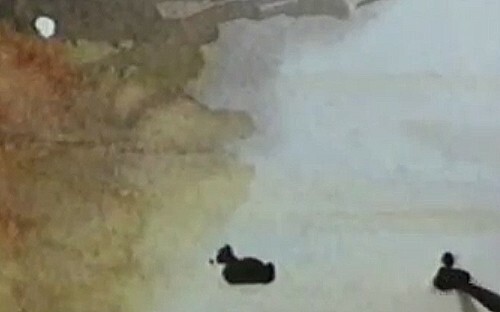 Add dots near the opposite shore for ducks. Blow dry. 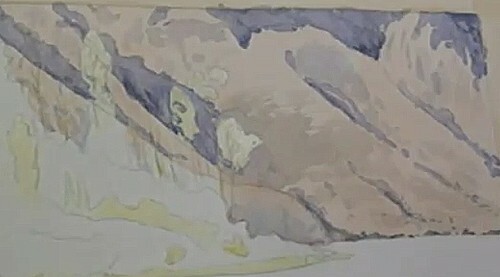 Make a light wash using cadmium orange and a touch of blue for the mountain. Blow dry. 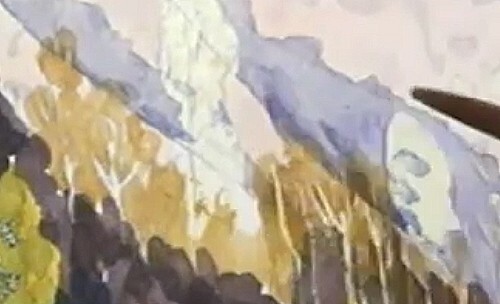 Mix several shades of ultramarine blue and alizarin crimson to make purples for the shadows on the mountain. 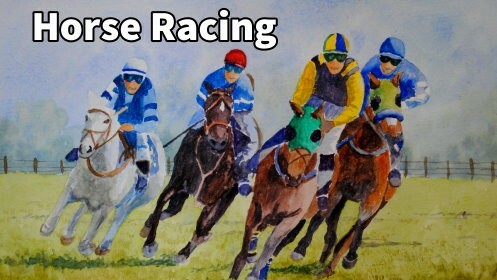 Add a touch of yellow ochre to some shadow colour for a dirty green for greenish tinge on the slopes. Use dark green for the small trees along the horizon at the base of the background mountain. 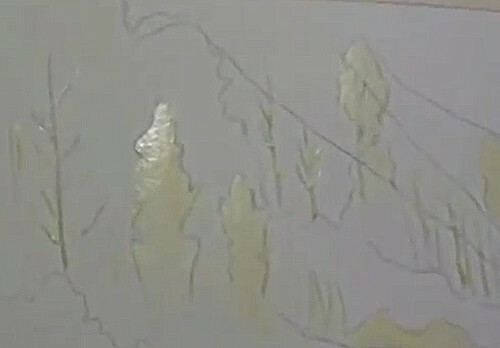 Add some tiny dots along the valley for the suggestion of trees. Mix a stronger purple for the deeper shadows. Tap the dark shadows into the surrounding areas to eliminate sharp lines. Blow dry. Paint the bright areas of the trees cadmium yellow. Make a strong mixture of ultramarine blue, alizarin crimson and a small amount of burnt sienna. 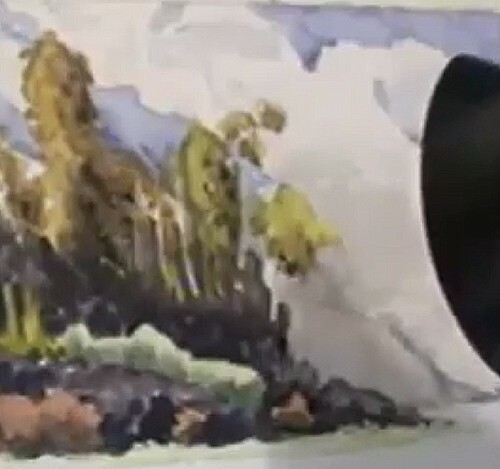 Use a technique called negative painting to define the bushes in front of the trees. Mix a strong blue-black for the darkest areas. 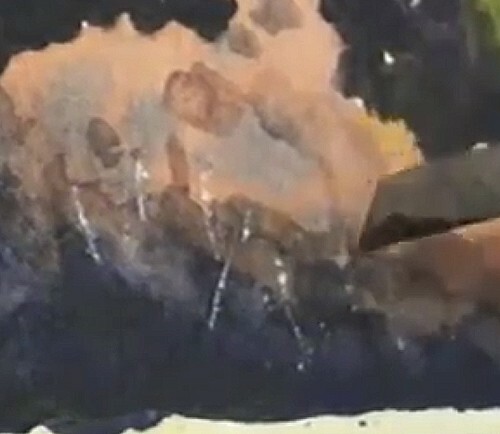 Mix some cadmium yellow with a touch of the blue-black mixture. Dab it on top of the bright yellow trees and then drop some of the dark colour into it so that the trees seem to half disappear into the shade. Paint the bushes with light burnt sienna. Add a few dark shadows. Blow dry. 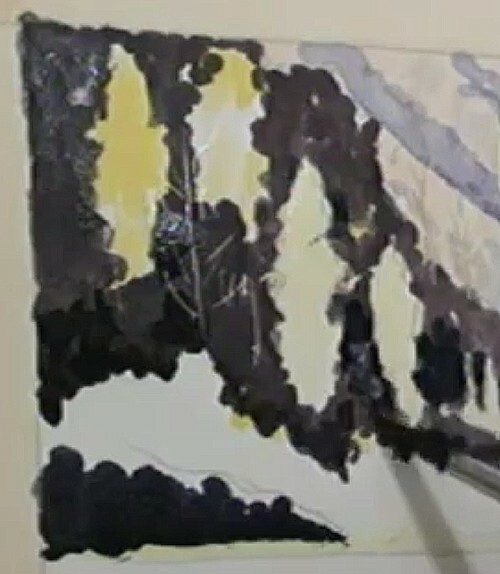 Remove the masking fluid from the trees and bushes in the dark area. 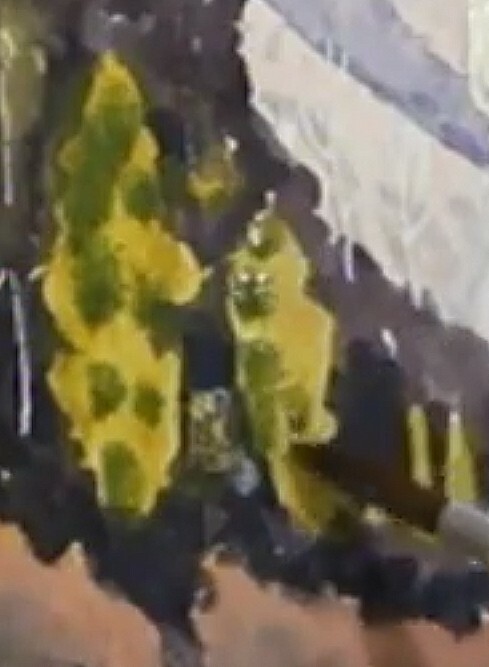 Mix a yellow-green using cadmium yellow and a touch of the dark mixture for the trees. Dab on a brighter green. 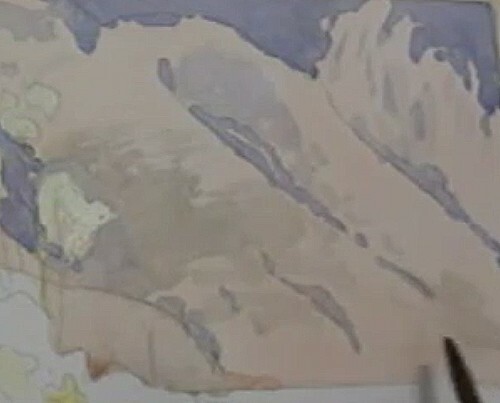 Add burnt sienna to the blue-black mixture for a brown-blue colour for the dark area in front of the mountain, the shadowy areas of the bushes and dab some on the bare tree trunks. 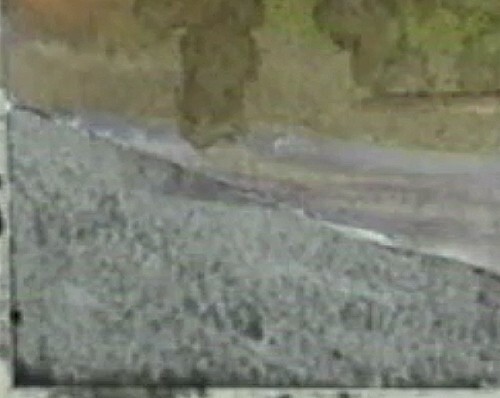 The base colour for the strip of bushes is light yellow-green. Shade the bottom of the bushes with a darker yellow-green. Paint the two smaller bushes burnt sienna. 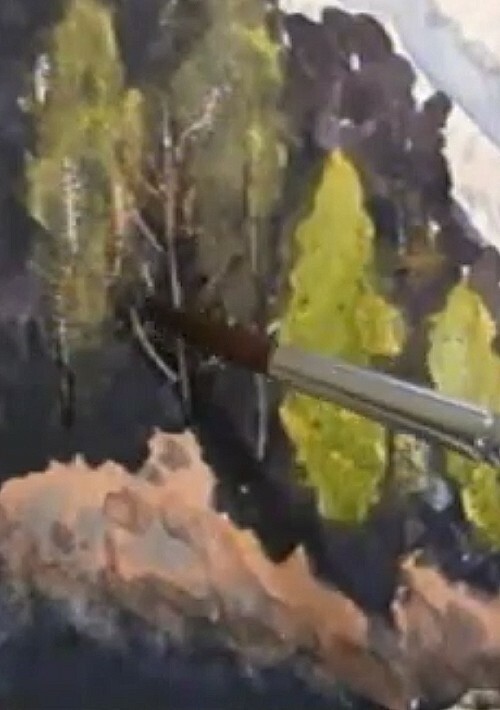 Mix yellow ochre into the yellow-green for a shady colour for the background of the trees in the sunlight. Blow dry. Remove the masking fluid from the rest of the trees. Use a strong yellow ochre for the large trees. Add a small amount of green. Soften the edges of the trees with a damp brush. 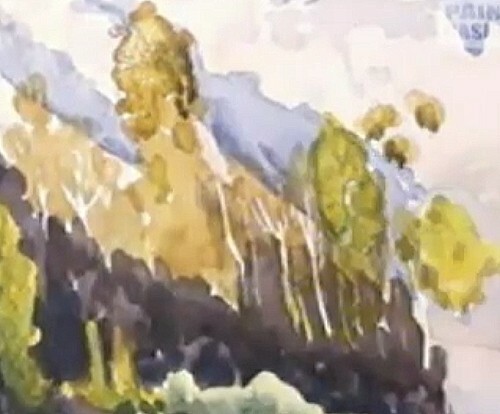 Drop some brighter green into the yellow ochre trees. Dab a darker colour into the trees for shading and molding. Add a darker green in a few places. Lightly dab with a damp brush to merge the colours. Add shadows to the small bushes. Blow dry. Use a craft knife to scratch out twigs in front of the bushes and randomly throughout the trees. Use a rigger brush to carefully add dark brown-green shading to the trunks of the trees in the sunlight as well as branches here and there – don’t over do it! Wet the water area. Start adding light ultramarine blue at the farthest point of the lake, darkening the blue as you work your way down the paper. 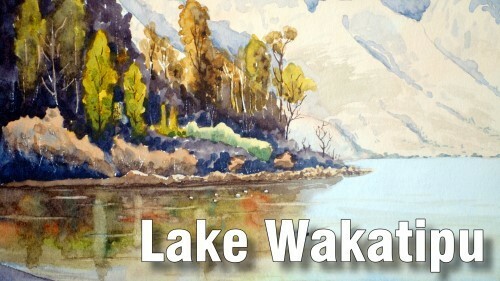 Add a dark mix of ultramarine, alizarin crimson and burnt sienna to the left side of the lake. Add yellow with a touch of the dark mixture into the reflection. Next add green followed by a stronger mauve-brown that starts at the water’s edge. 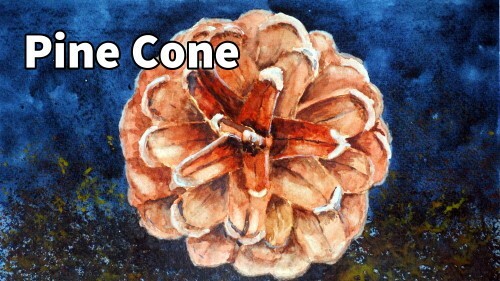 Drop some burnt sienna in to reflect the bushes. 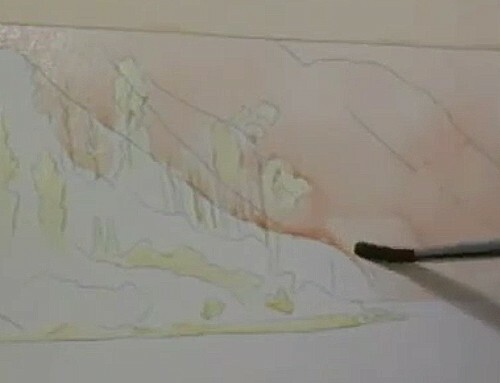 Use a light burnt sienna to reflect the background mountain. Next add a darker blue up from the bottom edge of the paper, blending the colours as they meet. 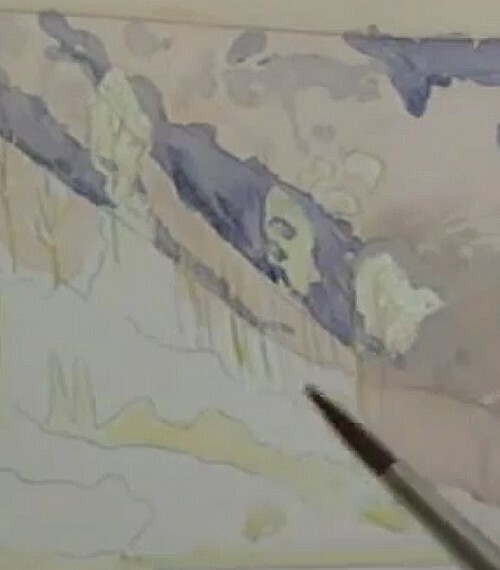 Add tree shapes with dark blue-green and cadmium yellow. Move the paintbrush back and forth to create the ripple effect. Blow dry. 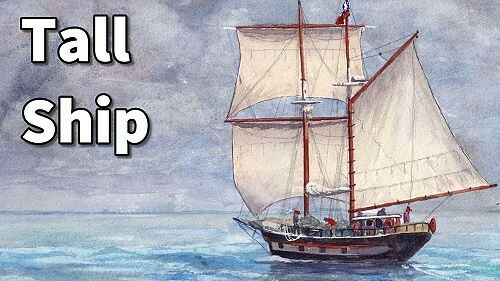 Pull out a few horizontal reflection lines with a damp flat brush. Reflection lines near the bottom edge of the paper are slightly angled. Lift out more colour as you approach the near shoreline to indicate the stones that can be seen in the water. Mix ultramarine blue and burnt sienna for the grey base colour of the rocky shoreline. Add alizarin crimson to the mix and run it along the edge of the water and roughly cover the base coat. Darken a few areas. Blow dry. Remove the remaining masking fluid. Build the colours of the shoreline from light to dark. Start with light orange. Add burnt sienna, leaving some of the lighter colour showing through and then add some darker brown. Use dark purple for the darkest shadows. 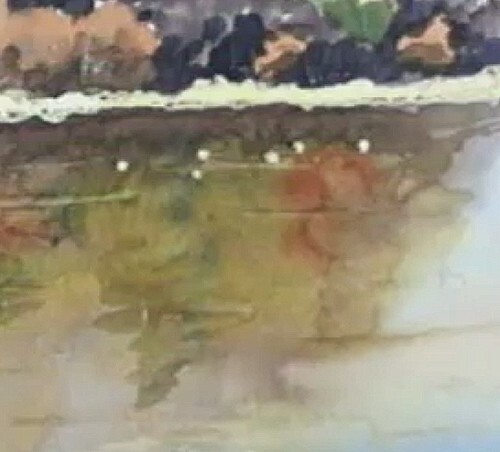 Mix burnt sienna and blue for the two dark ducks and the edges of the white dots to give the impression of ducks near the opposite shore. Paint the wake lines for the two dark ducks. Add the duck reflections by painting a zigzag line below them, leaving a little space between the body and the reflection. Blow dry.